Have you heard about this movie called TED?? It's a film by Seth MacFarlane that stars Mark Wahlberg and Mila Kunis. 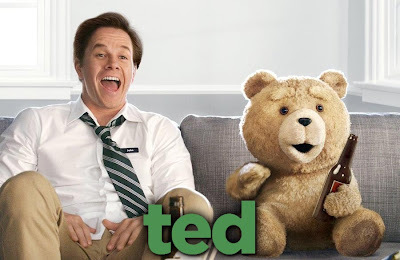 It's a story (really a bromance) about a grown man name John (Wahlberg) who lives with his potty mouth friend, Ted (voiced by Seth MacFarlane). Ted is his childhood teddy bear that he wished into existence who hangs out all day at the packie (Liquor store). If you haven't seen the trailer, click here. JenniSixx and I cannot wait to see this movie!! It looks so freaking hilarious. Especially for us Bostonians because they nail the accent and attitude of us perfectly! Are you planning on seeing Ted? Let me know, I love hearing from you.